As I sit here writing code for my directx keyboard handler, I keep reminding myself that I'm not supposed to like LCD monitors. All of my computing existence I have have preferred traditional CRT technology over LCD for various and assorted reasons. So why am I writing this while sitting in front of a Samsung 915n? Maybe my eyes are getting used to LCD technology from using them at work, or maybe I like the fact that they take up way less space and power. The simple fact of the matter is that I have been using this monitor for several weeks under a wide variety of situations and I think that this LCD monitor is starting to grow on me. Of course its not perfect and there are still situations that I prefer a good old CRT, but the benefits are growing while the caveats are shrinking. 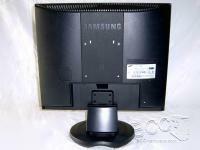 In this review I will be taking a look at the Samsung 915n to see how well this midrange LCD would work sitting on your desk. I must admit that I did not intend on reviewing this product originally. Instead my intentions were to borrow it from Zeus for a week to take to Fragapalooza (Canada's largest gaming event). However as I used this monitor I came to the realization that here was an LCD that suited my picky eyes. I don't have a lot of fancy testing equipment for resolving contrast ratios and light consistency, so this review will be based around what my eyes can perceive. Packing for this product was exemplary as is usual for Samsung. 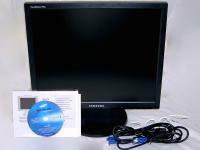 This monitor includes the usual accessories of VGA cable, power cable, software CD, and manual. Well, its not really a manual but a quick setup guide. The full manual can be found on the installation CD which I had a few problems running under Windows XP 64. The autorun function did not work but I was still able to browse the CD and find the manual. Samsung also has this manual available online as well. It is very detailed and gives extensive information on all of the settings that are available to the end user. There are also sections dealing with unpacking and driver setup although these are likely to be of little interest to the average user. 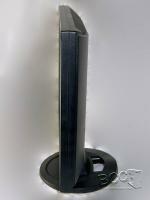 The SyncMaster 915N meshes sturdy construction with eye pleasing design. What I liked most about the design was the thin bezel that just seems to disappear. 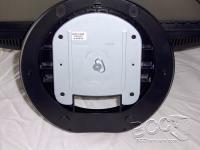 The base can be detached with a single thumbscrew which is a definite bonus for LAN parties. The panel can be tilted up and down to match the users viewing angle. This model does not have the ability to swivel, although in the target audience I don't expect that to be much of a problem. All of the adjustments are done through six small buttons on the lower right of the panel. The buttons are well designed and tend to blend in well, maybe too well. With direct light they are easy to read and use, but in a slightly darker environment you end up guessing which is which. I have to admit I had a hard time finding the right button in the rather modest light of my office. It would be nice if Samsung would make raised symbols on the buttons so they could be located by touch. All in all I would have to say the design is classy but simple and that's just the way I like it. Since each users viewing preferences will be different, Samsung has included a plethora of controls to help you get the most from your viewing experience. I will go over a few of them here. 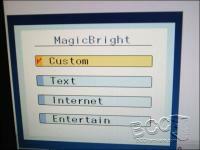 All Samsung monitors nowadays come with a feature called Magic Bright. You can bring up a menu and choose from 4 different color profiles, Entertain, Internet, Text, and Custom. Their titles kind of give you a clue as to what they do, but since I didn't like any of the 3 standard profiles I went straight to custom. Under the â€œCustomâ€ setting you are free to modify all the settings manually using the OSD menu. 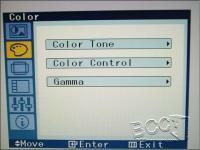 In the menu you may adjust brightness and contrast, color tone, color control and gamma. The only one I will touch on here is â€œgammaâ€ which is defined as â€œA measure of contrast in photographic imagesâ€. Samsung gives you three gamma settings for this monitor and for my eyes I found that the 3rd setting gave me the best results. I was very pleased to see this setting included in the menu since I run my displays quite dim generally and they often appear washed out. By allowing gamma adjustments I was able to keep my low brightness and yet have a clear distinct image. 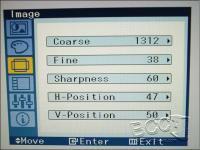 Moving on to the next menu we find such adjustments as, Coarse, Fine, Sharpness, V, and H positions. To be hones I never saw very much of a difference when adjusting the â€œcoarseâ€ or â€œfineâ€ settings. The â€œsharpnessâ€ setting seemed to only alter the image slightly. The Vertical and Horizontal settings worked fine, but using the â€œauto adjust feature will negate you ever having to adjust these controls. The 4th menu allows adjustment for the onscreen menu. 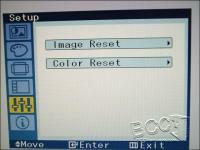 Using these setting you can set the language, where the menu appears on the monitor, the transparency as well as the time before it automatically disappears. I especially like that last setting. If you get things totally mucked up you can reset the display to default with the 5th menu. 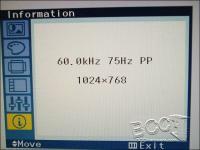 In the last menu screen you find some common information for the display such as resolution and refresh rate. While this information may seem superfluous at first, I often use this screen while in a game to see if my refresh rate overrides are being obeyed. I thought that this menu was very well laid out, easy to use and included all the controls I need to make the picture look great to my eyes.